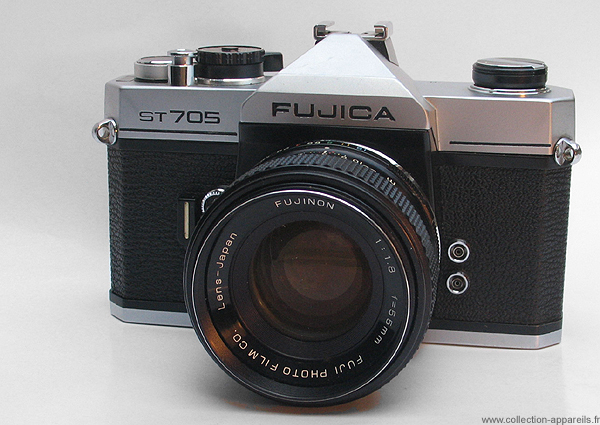 The ST705 is delivered with a 1.8/55mm lens (42 screws) with six elements and a minimal focusing distance from 45cm. The lens is locked at the end of the screw. The shutter allows shutter speeds from one second to 1/1500 per sec, plus the B setting. It is synchronized with electronic and magnesium flash. The TTL meter with two silicon cells meters the shutter speed at full aperture. Like the 605, 801 and 901, its reflex room is coated with a flocking to avoid flares.